The following appeared in the Sunday, June 2, 1996 edition of the Lafayette, Louisiana The Sunday Advertiser, Acadiana Life section. The first Bourgeois in North America was Jacques, who came to Acadie in 1632, probably with his brother-in-law, Germain Doucet dit Laverdure. The two men were most likely officers in the contingent of soldiers who came to the colony with Isaac de Razilly, who retook Acadie from the English in the name of the King of France in 1632. With de Razilly, he first settled at La Hève, on the southern coast of present day Nova Scotia. In 1636, after the death of Razilly, the new governor, Charles de Menou d’Aulnay abandoned La Hève and re-established the colony at Port Royal to the northwest. One of Jacques’ sons, Robert, either came with his father to Acadie or else joined him later. Jacques would later serve as lieutenant of the garrison at Port Royal under Germain Doucet. Robert Bourgeois was also an officer of the garrison. Another son of Jacques, also named Jacques, was born in 1621 in France at La Ferte-Gaucher, church parish of Saint-Romain. René Perron, a French Acadia genealogist says that Jacques was born there on Jan. 9, 1621, the son of Jacques and Marguerite Bourgeois. Jacques Bourgeois, son, was a surgeon. He may have learned this profession in a commandery of the Order of Malta near his home in France. He joined his father and brother in Acadie in 1643, likely making him the first to practice medicine in the colony. In 1643, Jacques Bourgeois, son, married Jeanne Trahan, the daughter of Guillaume Trahan and Françoise Corbineau, at Port Royal. Jeanne, who was born at Bourgueil in the French province of Anjou, was only 14 years old at the time of her marriage to the younger Jacques. This union is the progenitor of the present day Acadian family, Bourgeois. In 1646, the Governor d’Aulnay granted Jacques and Jeanne Bourgeois an island called Isle aux Cochons situated in the Dauphin River (today called the Annapolis River) just upstream from Port Royal. In 1654, the English Major Sedgewick attacked Port Royal, despite the fact that he had no orders to do so and that France and England were at peace. The fort was surrendered after many days of a siege, and both Jacques , father, Robert, and Jacques, son, participated in the battle. Following the battle, Jacques, father, and Robert are forced to leave the colony and return to France, consistent with the terms of the surrender. Jacques and Jeanne Bourgeois remain, however, and by this time, they have a family consisting of two daughters, Jeanne and Marie, and two sons, Charles and Germain. The English did not leave a presence at Port Royal and in 1667, the colony is ceded to France, although the French do not take possession until 1670. In the interim, the Acadians governed themselves under a syndic ruled by Guillaume Trahan, the father of Jeanne Bourgeois. By the census of 1670, Jacques and Jeanne had added six children, one son, Guillaume, and five daughters, Marguerite, Françoise, Anne, Marie (the younger) and Jeanne (the younger). In this census Jacques is the richest inhabitant at Port Royal. Also, by this time, Charles, their oldest son had married Anne du Gast (Dugas), and they have one daughter, Marie. The oldest daughter of Jacques and Jeanne was also married by 1670, to Pierre SIRE (CYR), and they had a son, Jehan. In addition to his profession of surgeon, Jacques is a farmer and marine merchant. His boats follow the coast of the Baie Française (Bay of Fundy) to trade with the Mic Mac Indians and descend the coast to New England to trade with the English. In 1671, Jacques, aided by his three sons and his son in law, Pierre SIRE, and his future son in law, Jean Boudrot, founded the settlement of Beaubassin, near the border separating present day New Brunswick from Nova Scotia. Jacques and his son, Guillaume, returned to live at Port Royal after the establishment at Beaubassin, although they kept farms at the new settlement. Jacques’ other two sons, Charles and Germain, stay at Beaubassin with their families. In 1686, Jacques and Jeanne moved definitively to Beaubassin to live with their son, Germain. On Oct. 15, 1687, Jacques Bourgeois signed a document, along with others, attesting to the works of the ex-governor d’Aulnay in the colony. At the beginning of Sept. 1696, the English Colonel Benjamin Church from Boston attacked Beaubassin, which has been left undefended by the French. Jacques is enlisted to negotiate with the English contingent from Boston. Jacques obtained a promise from Church that the residents would be left in peace, but Church reneged on his promise and the soldiers from Boston burned most of the homes in the region. The Acadians of Beaubassin were forced to flee to the woods; however, the English respected the Acadians’ capabilities as marksmen and refused to chase the Acadians out of the reach of their ship’s cannons. Jacques died shortly before 1700, as he is not listed in the census of that year. In 1702, the commandant of the fort at Port Royal referred to him in an official report as the late Jacques Bourgeois. At the time of the deportation in 1755, many of Jacques’ grandchildren were deported to the American colonies where they suffered greatly. Some eventually made their way back to Canada, and the Bourgeois name is common today in southeastern New Brunswick. Others made their way to Louisiana during the mid-1760’s. At least nine Bourgeois men settled on the east bank of the Mississippi River in St. James Parish. Five of these, Paul, Joseph, Michel, Pierre and Jean-Baptiste, were brothers, the sons of Paul Bourgeois and Marie-Josephe Brun, originally of Beaubassin, Acadia. From this group came a number of successful sugar planters in St. James Parish. Beginning in the 1790’s and continuing into the 1820’s, some of the children and grandchildren of the original Bourgeois settlers moved to Bayou LaFourche. Most settled below Thibodaux. At least three of the sons of the original Louisiana settlers migrated further west, to the Attakapas. Simon (son of Joseph Bourgeois and Marie Giroir) and Joseph (son of Pierre, Sr. and Marie Bergeron) settled on the Bayou Teche north of St. Martinville. Louis (son of Michel Bourgeois and Anne Landry) settled on Bayou Vermillion near Lafayette. Another Bourgeois, Jean-Baptiste and his wife, Marie Borel, settled on the Teche south of St. Martinville. Many of his descendants eventually settled further south, near Charenton and Franklin. You can join the international Bourgeois family association, “L’Association des Bourgeois d’Amerique” and receive their newsletter by sending $10 to Paul-Pierre Bourgeois; C.P. 117; Grand-Digue, N-B, EOA 1S0, Canada. 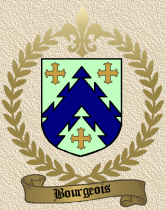 This Acadiana family history is sponsored by the Congres Mondial Acadien-Louisiane 1999 and its commercial sponsors, Our Lady of Lourdes Regional Medical Center and the Foundation CODOFIL (note: Council on Development of French in Louisiana). If you have more information about the Bourgeois family, or if you would like to volunteer for the 1999 CMA, please call (318) 234-6166 or write to CMA-Louisiana 1999 at C.P. 3804; Lafayette, La. 70502-3804. The CMA is also soliciting historical information at the present time on the following families for later publication: Blanchard, Bergeron, Bourque/Bourg, Brun, Breaux, Comeaux, Cormier. “I copied this from the cited source this morning, and made every attempt to spell each name as printed. Hopefully, you can find the appropriate place to post it for other researchers use. I also plan to post it to the Cajun roots newslist. Please let me know if you can use additional info like this in the future”. “I have not had an opportunity to check out the relationship of this family to that of my wife’s earliest Bourgeois who was born in St. James Parish, LA in 1802. I would love to hear from anyone, though, that can help me connect her Thomas D’Aquin Bourgeois (married Marie Celeste Matherne, 8 Feb 1831) to any of the nine Bourgeois men named in the article that came to Louisiana”. NOTE I am grateful to Jason Bourgeois [[email protected]] for having provided me the following corrected information which was subsequently published in the October 6, 1996 Daily Advertiser under the heading “Bourgeois Update”.